It's that time of year ... if you have young children in school, you know what we're talking about: 100 days of school! This milestone is a big deal, especially for little ones; so much learning and growth happens in the first 100 days of the school year! 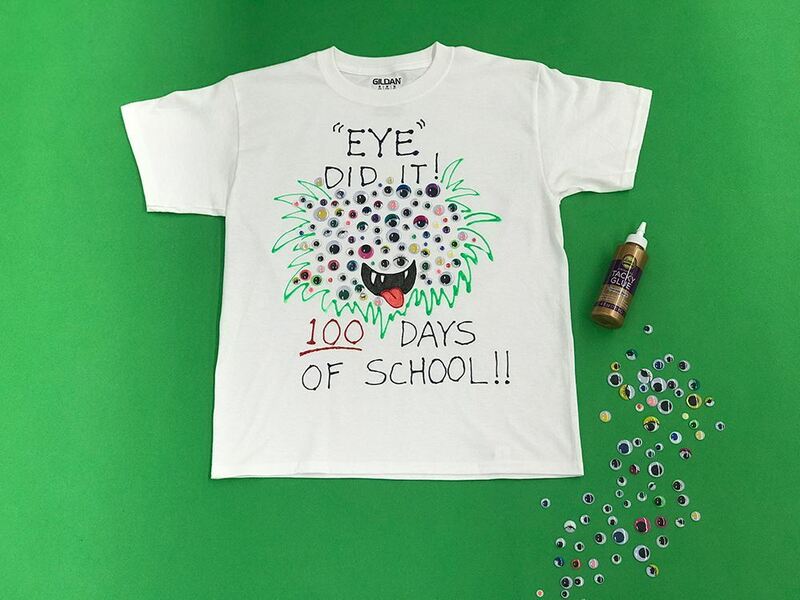 Gather the kiddos and celebrate this special day with a creative project like this googly eyed monster T-shirt made with kid-friendly Tacky Glue and 100 silly googly eyes. What an adorable way to celebrate! Insert cardboard or plastic inside of shirt to prevent paint and glue from soaking through to backside. Use Dimensional Paint to write out 100 Days of School messaging on shirt. Tip: you can first use a chalk pencil to draw out the design and trace with paint if you aren't comfortable using paint right away. Create monster design with paint, leaving space for 100 googly eyes. Let paint dry. Glue googly eyes all over monster face design by adding a drop of glue to backside of each googly eye and pressing in place on shirt. Tip: If your child plans on wearing the shirt multiple times, try using Fabric Fusion Permanent Fabric Adhesive instead for long-term washing and wear.